Model: The model has an mfx decoder and controllable whistle sound. It also has controlled high-efficiency propulsion. The model has a special can motor with a flywheel and a cardan shaft to the power truck. 2 axles powered. Traction tires. The Swiss headlight / marker light code of triple headlights and 1 white marker light will work in conventional operation and can be controlled digitally. You can also switch to a red marker light. The model has factory-installed interior lighting. The headlights, marker lights, and interior lighting are maintenance-free warm white and red LEDs. 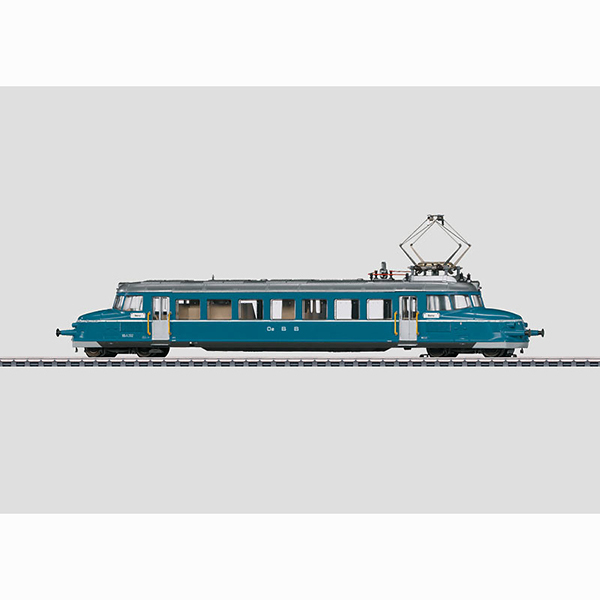 The model has a double-arm pantograph with a narrow wiper. Total length over the buffers 25.7 cm / 10-1/8". Warm white LEDs for headlights and interior lighting. Ability to switch to red maker light. During their service lives the Red Arrows were rebuilt several times, were updated technically, and were given new class numbers. The first one was retired and scrapped in 1966 as the class RBe 2/4. By 1974 two units were left on the SBB's roster, of which one was sold to the OeBB and was in operation several more years in the unfamiliar blue paint scheme. One unit still exists as an historical powered rail car and harkens back to the time of the Red Arrows in the service of the Swiss Cross.